This September, the government begins a pilot of its new English and maths tests for four-year-olds. Children in reception will be tested within a few weeks of starting school and the results will be used to judge schools against each other. Parents, teachers, heads and education experts all agree: testing four-year-olds makes no sense. The government hasn’t produced any evidence to show that small children can be reliably tested but they are spending £10 million to go ahead with the scheme anyway. The British Education Research Association describes the plans as “flawed, unjustified and totally unfit for purpose” and we agree. Starting school should be an exciting, stimulating introduction to the joys of learning through play. Those crucial early weeks should not also include tests which reduce children to data points. Let’s stop the government’s plans in their tracks. Join our chalk protest to spread the word. It’s easy to take part. 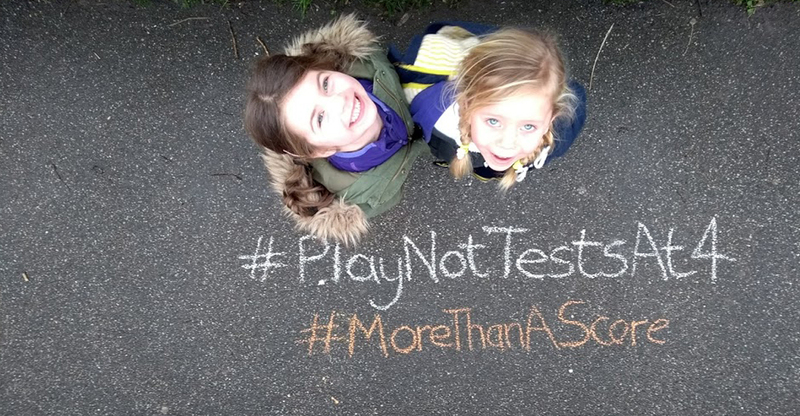 Just chalk the message Play Not Tests at 4 on a pavement near you. Or, if your headteacher shares your views, ask if you can leave your message in the school playground. Then, take a photograph and upload it to social media. Don’t forget to include #PlayNotTestsAt4 and #morethanascore and let us know your location. Tag us on Twitter @morethanscore and/or Facebook: @morethanascore. We want to make as much noise as possible, so please get involved and spread the word to friends and family.